Belagavi (Karnataka), Nov 23: The Karnataka assembly on Wednesday here passed a bill to regulate the functioning of private hospitals across the state. 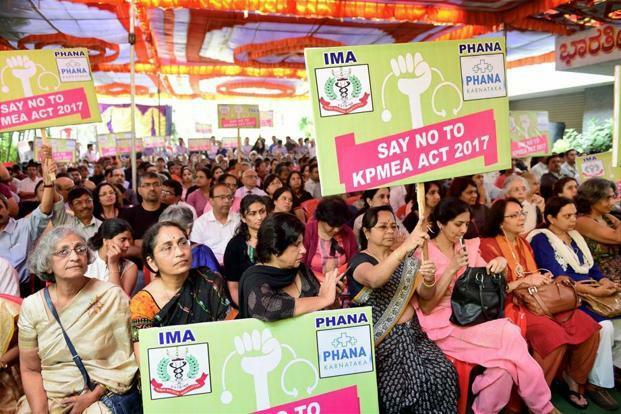 "The Karnataka Private Medical Establishments Act (Amendment) Bill 2017 has been passed in the Assembly by voice vote after discussion on its various provisions by lawmakers of the ruling and opposition parties," state Health Minister K.R Ramesh Kumar told reporters here. The Bill was tabled in the lower house on Tuesday after the state government modified some of its provisions as demanded by the private doctors, who went on a five-day strike last week, affecting thousands of patients across the state. "We are planning to set up a regulator, headed by a retired judge, who will oversee the functioning of the private hospitals and ensure quality healthcare for the people across the state," Kumar said during the debate on the Bill. Opposition BJP and JD-S members, however, expressed concern over the quality of healthcare in the state-run hospitals, shortage of doctors and medical equipment, which force patients to seek treatment in private hospitals at prohibitive cost. "A provision has been made to ensure private hospitals and their doctors will attend to emergency cases without insisting on advance payment from patients or their family," Kumar reiterated. The Bill has excluded the provision to form the Grievances Redressal Committees at the district level as demanded by the private doctors. Aggrieved patients can approach the District Health Officer or the Karnataka Medical Council under the provisions of the existing act. Penal provision to jail doctors or pay hefty fine for medical negligence was also dropped from the Bill, which has a provision to display the cost of treatment, including surgeries, operations and diagnostic tests in all private hospitals. "Patients can also question the private hospitals, nursing homes, clinics and diagnostic labs if they are charged more than the specified cost and complaint to the DHO or KMC," Kumar assured the members. The Bill has provision to enable the state government fix the treatment cost for BPL (Below Poverty Line) patients referred to private hospitals under its health insurance scheme. In the case of Above Poverty Line (APL) patients, the state government will bear 30 per cent of the treatment cost in private hospitals. Of the registered 1.25 lakh doctors in the state, about 10,000 of them are employed in the state-run hospitals, while over a lakh work in about 40,000 private hospitals, nursing homes and clinics across the state. The 10-day winter session of the state legislature is being held here since November 13.